This application is made by security researcher Steve Gibson. To fully protect against both attacks, users have to update both their BIOS and operating system. This can have a negative impact on performance, depending on the tasks performed on the computer. InSpectre shows which updates have been installed and what has to be done to protect the system against the attacks. 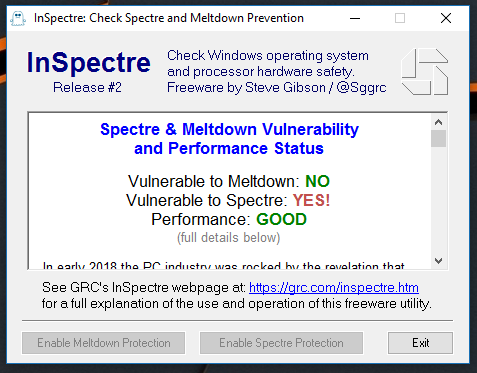 The tool also makes it possible to enable or disable protection against Spectre and Meltdown. Gibson warns that his tool is new and that conclusions on the output of the tool should be carefully considered as he writes, “it has been carefully tested under as many different scenarios as possible. But new is new, and it is new. We may well have missed something. So please use and enjoy InSpectre now. “But you may wish to check back in a few days to see whether we may have found and fixed some last bits of debris,” Gibson adds. Release #8 — Now shows whether an Intel microcode patch is (ever) available for Spectre. Intel has finished designing microcode update patches for its processors. On April 2nd, 2018, they announced that processors that have not yet been patches will never be patched. Their full statement is available in this PDF document. In that document, Intel specifies which of their many processors do have patches and which of their more recent processors will never receive updated firmware. Now that the industry has this information, this 8th release of InSpectre incorporates that list of CPUIDs and displays whether microcode firmware updates exist for the system's Intel CPU. If the Disable buttons really work this tool can be handy for benchmarks. It can be easy to take all protections off and test benchmark scores pre and post protections. Well, at least antivirus software been able to detect a spectre executing pattern. Not bad. There no such thing as "trusted". If you want to be sure, download source code, review and compile it on your machine. 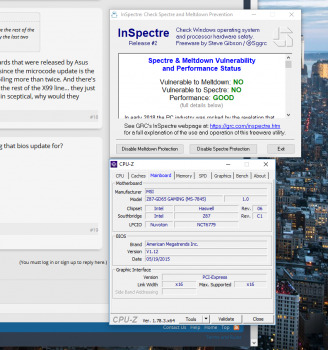 There been lots of spectre checking software floating around, could be safe, could be not! I don't really care if I am affected by spectre exploit or not. There god know how much else exploits floating around, yet to be discovered. Just enjoying watching everybody losing their sh*t over it. 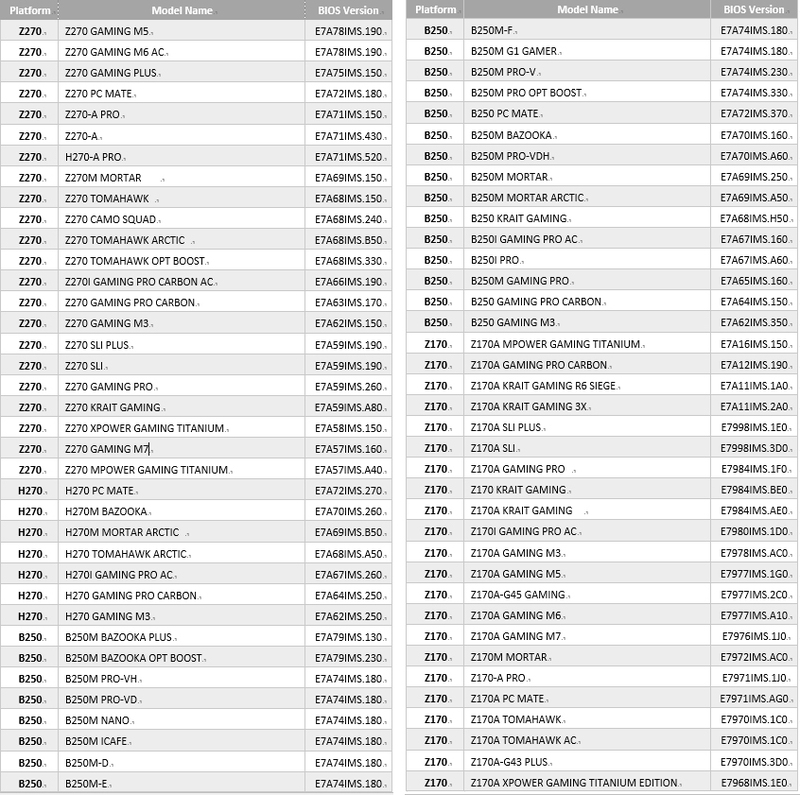 Totally 100% trusted, this is from Gibson security research (Steve Gibson). Note that it'll only show fully green if you already have an updated BIOS. Thanks for the link, but I'm fairly aware I'm still vulvernable because Asus does not provide any updates for the Rampage 5 Extreme besides their stupid RGB everything version. I'm actually rather pissed about it, that board cost a ton of money and they can't even give you a BIOS, yet they offer it for other boards with X99. 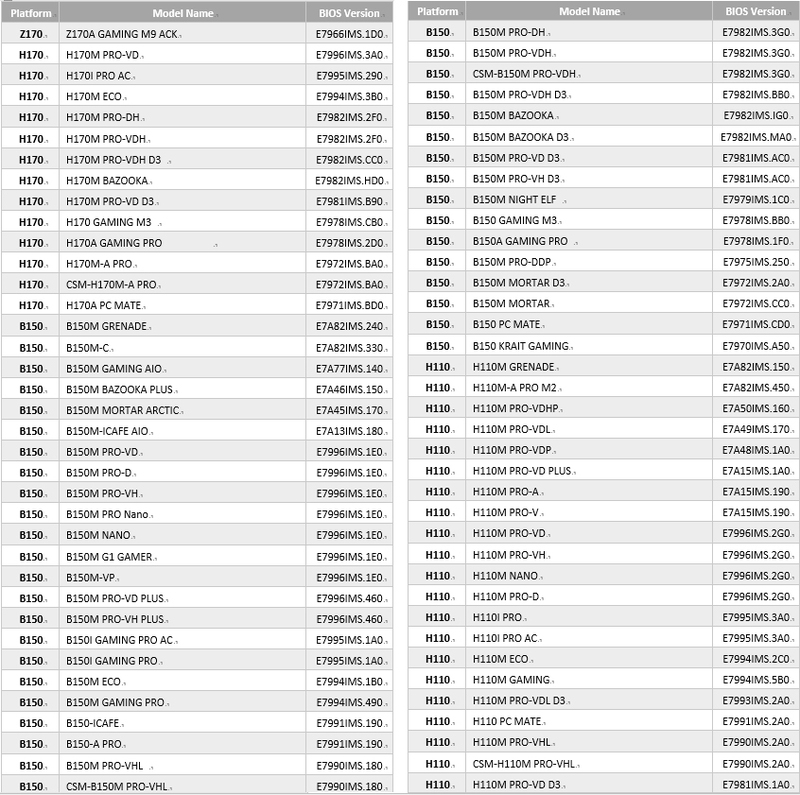 Was looking for updated bioses on the motherboard's page but NOTHING NEw for X299-series, 200-series, 100-series and X99-series motherboards! Accoding to this ASUS page, a good bunch of Asus mobos will get the spectre fix. I don't see the bios version listed for my mobo available anywhere, so I assume it's still being verified. Good to know it's coming, though. No fix for Rampage 5 Extreme. Tbh, it's a disgrace. It would be pretty weird if they make a bios for two random X99s but leave the rest of the X99 mobos intact. Or is there something special about those two? Are they the last two with some new mobo architecture implemented? Something strange, this tool gives me a different result than the microsoft powershell script check. With MS script I am supposed to be protected. With this tool I am not protected against Spectre. Asus Z170-Pro with BIOS 3703 and windows 10 1607 up to date. 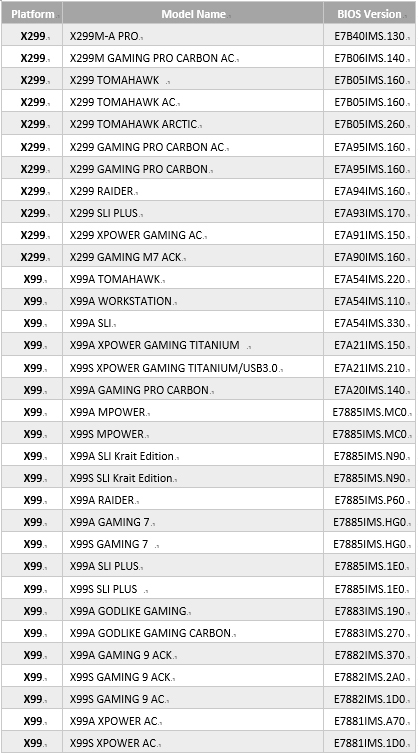 I'm not sure but it could be that they were the last two boards that were released by Asus with the X99 chipset. But that's still not making any sense since the microcode update is the same for every X99 board, they'd just have to do the compiling more than twice. And there's yet no official statement of Asus to what's happening with the rest of the X99 line... they just said they'd fix everything by the end of January, but I remain sceptical, why would they announce those two boards and not the rest then? Anybody know what is the oldest Mobo MSI are supporting that bios update for? Ive just updated my own bios with UBT containing latest CPU microcodes that have spectre fixes. Tool from https://www.win-raid.com/t154f16-Tool-Guide-News-quot-UEFI-BIOS-Updater-quot-UBU.html latest version has the latest Intel Microcodes dated 20/11/17 that have Spectre fix. You download a copy of your latest bios, run UBT, open your bios, update CPU Microcode to latest (may as well update all other stuff - Intel OROM etc etc) save bios, then flash this bios on your mobo. Viola you are upto date. Lol! mbk1969 did it first, then Ashampoo utility. I can bet I'll end up with more tools to remind me of upgrading, than one that actually FIXES THE ISSUE! I'm hating Intel right now...but not that much..my cpu is running real good tbh! PC parts can smell the aroma of "replacement"
Still nothing from Gigabyte for Z87. Well, Microsoft did it first with their PowerShell script. And script is sky high cool. I just translated it to C# (to build standalone app) seeing many guys here having trouble with PowerShell. Hold your anger my young padawan. There are no stable microcode updates for broadwell/haswell available so really an update is still required by intel.